Strawberry Bread - a wonderful way to use up all those yummy summer strawberries. Ready for the oven in minutes! Flour, sugar, baking soda, salt, cinnamon, eggs, oil and strawberries. Freezes well too! Strawberries are one of my all-time favorite fruits. I just love them! I especially love them in this delicious Strawberry Bread. 😍 I've been making this bread for years, and I just realized that I've never shared it on the blog! I had to rectify that oversight ASAP! This recipe is too good not to share!!! 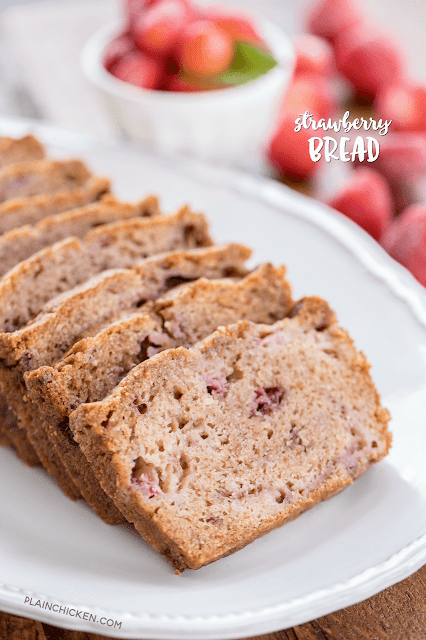 This Strawberry Bread is so simple to make. It only takes about 5 minutes. The hardest part is chopping the strawberries. I usually have some chopped strawberries in the freezer just for this bread. I stock up on strawberries when they go on sale at the store! 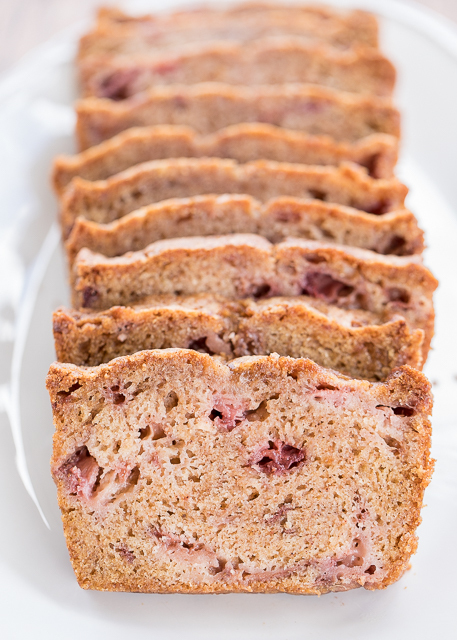 This Strawberry Bread is great for a quick breakfast or dessert. It also makes a wonderful homemade gift! I love to give this as a thank you, hostess gift or house warming gift. Preheat oven to 350ºF. Lightly spray a 9x5x3-inch loaf pan with cooking spray. Set aside. Combine flour, sugar, baking soda, salt and cinnamon in a large mixing bowl. I wonder if you could use thawed frozen strawberries? I have a huge bag of them that I bought for something else and didn't use all of them. Yes, you can. Just be sure to drain the juice. Don't want too much liquid. You absolutely can - just thaw them first. I've made this with frozen strawberries and it turns out great! You stole my recipe! I have been making strawberry bread for 20 years. Great treat during the season. In my opinion, best served warm and with butter. Yum!! Linda - we LOVE this strawberry bread too!!! I agree, it is wonderful with butter! I've been making strawberry almost identical to this for years, but my recipe used vanilla instead of cinnamon in it. Wow. Cinnamon makes it even better!! So glad you shared this. We LOVED the cinnamon! Enjoy! The print button is not working, as of 11/12/2018. I just checked the print button and it works fine. Check that you don't have your pop-up blocker turned on. If that doesn't work, try a different browser. Does this have to be stored in the refrigerator? I thought about making some to give as gifts, but not sure how practical it is.